Ok, so I've gotten away from the "go-fast" era of my life, and I am getting more and more appreciative of time spent enjoying the journey. That being said, some of you may recall that I bought this back in the winter. I have spent the last few months getting everything cleaned/repaired/prep'd for use this summer. I have run into some problems that needed corrected, shortcomings that I have improved, and some other odds-and-ends that I plan on doing. First and foremost, I am making this thread to detail my own involvement with my personal camper. There are many variations among different manufacturers, so some of these may or may not apply to other models. Some of these fixes can be applied to any camper, while others may or may not work for other units. I'm just trying to help any newbs who may want to get into camping. It is classed as an "ultra-lite" camper; dry weight is listed as under 5000 lbs with a gvwr of 6500 (2x 3000 lbs Tor-Flex axles plus an estimated 500 lbs tongue weight). The trailer is in the 30-ft. class, and comes nicely appointed. There is ample room for sleeping 6-8; more if children are smaller. The unit has a half-sized slide on the left side of the unit; it is the kitchen and J-Steel sofa that are on the slide-out portion. There are a few things to remember when utilizing a camper. This is a small residence; as such, you must perform much of the same maintenance you would on your own house, but on an accelerated schedule. Imagine if you lived where a small earthquake occurred every time you used your residence. This is akin to what your camper undergoes while in motion. The structure twists and bends to accommodate chassis flex. As such, you need to keep a close watch on plumbing fixtures and points of moisture entry (read: slide-outs, windows, skylights, and A/C openings). Most, if not all recently manufactured campers made by your major players will utilize PEX-style piping and connections for the plumbing in your camper. This is preferred, as the PEX will bend and flex with the unit without breaking like copper or other solid connections would. Keep in mind, though, PEX utilizes washers at every fixture, and those washers will degrade with age. I have used appropriately-sized urethane O-rings with good success in repairing PEX connection leaks (3 so far). The nice thing is they are a simple screw-on connection that shouldn't require any tools to tighten appropriately. Most of the other PEX piping should be maintenance-free, as it won't otherwise degrade with age/use unless exposed to extreme temperatures or pressures (open heat sources or freezing temperatures with water in the lines). A multi-pack of O-rings will go a long ways to curing any headache you may encounter while on the road. I keep two packs in the camper. But how do you store and use water? Most campers will have a hot water heater in the 6-gallon range. Some exceptions are larger motorhomes and park-model trailers that will utilize smaller, "residential-grade" units. 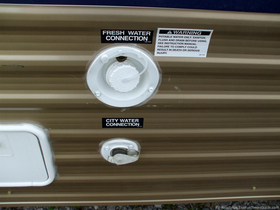 A standard 6-gallon RV-grade water heater will have a "dual-function" in most cases: 110V electric and LP gas. In this photo, the flame and ignition are housed in the bottom right corner. The silver metal "box" in the top left corner is the exhaust for the gas flame. This will get HOT during operation. It is good practice to pull the cover of the heater during the first couple uses of the season to verify no problems exist during startup. Always verify the flame when igniting after setting up via the inspection port on the water heater cover. If using 110V, you don't have to verify the flame (obviously), but you should commit to removing and inspecting the heating element at least once a year (preferably twice or more). This will ensure that the unit stays at peak performance. Should your electric element need replacing, it's an inexpensive part: Google Shopping Link Always make sure to drain your hot water heater while winterizing to avoid splitting the tank. As a trick, if you have multiple people showering in the RV, switch both the electric element and LP gas on (they can operate simultaneously) to reduce warm-up time between showers. Obviously this only works while hooked up to 110v electric power. Make sure to switch your LP mode off to conserve gas after everyone is clean. There are two sources for water in most campers: "city water" connections, and a fresh water holding tank. City water connections are great for campgrounds, as they allow you to keep your camper lighter while towing (no water in the holding tank), and the water is certainly clean. The only source of frustration with this (at least, for me) has been the City Water connection valve. The previous owner of my camper did not maintain the connection, as it was always hooked up. This connection is supposed to act as a one-way valve; when using the water pump and fresh water tank, a small rubber valve in the connection closes and prevents water from shooting out of the city water connection. Mine had degraded due to the unit being stationary and always attached to a hose. Imagine my surprise when water was shooting out of the connection when I switched on the water pump for the first time! I chose a KISS method to fix it for the time being and used a $1.50 hose shut-off valve, rather than order and wait for a $30 new city water connection. I plan to order one eventually, and will get a 90* hose connector as well. It's also not a bad idea to include an inline water filter such as this one. Fresh water holding tanks allow you to live off-the-grid if you so choose. Keep in mind, your holding capacity is limited by what size tank your RV has. Typical sizes range from 20-40 gallons, with other specialty models offering from 0 to 100+ gallons. Gray and black water capacities should be sized according to fresh water capacity, erring on the side of caution; that is, the combined gray and black water capacity should be larger than the fresh water capacity. When dumping gray and black water tanks, always dump your black tank first, and be sure that there is plenty of water in the black tank to help suspend any solid waste before dumping. A good way to accomplish this is to add at least 3-5 full toilet bowls of water (approx 3-5 gallons) to the tank prior to dumping. Never dump a tank that is not at least 2/3rds full. If you are lower than that and need to empty your tanks, add water until your gauge reads 2/3rds or more full. There are two types of air conditioning units, with two ratings that dominate the market. First, there is non-ducted air conditioning. These units are usually found on smaller trailers and campers, and blow air directly from the bottom of the unit. Most of the time, they are centrally located, and work well for an open floorplan. The second type is a ducted unit, usually found on larger floorplans. This allows better airflow in larger trailers, especially where bedrooms are the farthest point from the air conditioner. Both of these air conditioners come in either 13.5K BTU or 15K BTU units. Many also have the option of manual control on the unit itself, or a thermostat control mounted elsewhere in the camper. Mine is a 13.5K BTU Coleman "Mach" unit that is thermostat controlled. This allows the unit to cycle, which saves energy and wear-and-tear on the compressor. RV air conditioners are a sealed unit, sealed from the factory. They do not require recharging like an automotive-style system would, and should one become discharged, the unit likely needs a total replacement. They do require the same level of upkeep that you would give to your air conditioner/heat pump for your residence. You should commit to keeping the coils clean of dust and debris for the best performance, and keep filters as clean as possible. Wash the exterior coils using water and a quality coil cleaner; don't get too excited with the water. Only use that which is necessary to rinse off the coil cleaner. While changing or cleaning the filter element, you should inspect the unit for air leaks or other maintenance needs. My ducted unit was having a difficult time keeping my trailer cool. I removed the filter cover and turned the unit on. I discovered the unit had a massive air leak that was allowing cooled air back into the air return. This caused a freeze-over of the unit, which reduced cooling capacity to near nothing. By using aluminum tape, I sealed up the air leak from both sides, and sealed the unit from the ceiling, as air was leaking past the ducts and straight into the insulation of the roof. The result was greater airflow to all ducts throughout the camper, and no problem attaining and maintaining a cool 70 degrees on a 90 degree day, even with the camper sitting in full sun. I likely could have gone lower with the temperature. Keep in mind, this is with a 13.5K unit; a 15K unit could have likely cooled the trailer to around 60-65 and maintained that temperature. You can also boost airflow and a/c performance by doing a few simple steps. When possible, park in shaded areas. Start your air conditioner well before the daytime heat has begun, as it's much easier for your a/c to maintain a temperature than to cool down from the heat of the day. Use fans to assist airflow; rooftop vent fans, such as a Fantastic Fan, will help with air circulation. Also, keep blinds closed and minimize trips in and out of your RV. If possible, grill food outside to avoid heating up the inside with the gas range. Cool... If you need advice on anything hit me up. Don't forget to service the anode (if you HWS has one) every 12 months, otherwise you'll be looking at a new unit sooner rather than later. Most campers will have two electrical systems a 12-volt DC system, and a 110V AC residential system. You should notice electrical outlets scattered throughout your RV. The 12-volt system will be fed by an inverter-charger and a simple deep-cycle automotive battery. More complex setups involve multiple batteries in various configurations. The majority of interior lights will be 12 volt lights. This is one area in which a simple solution exists to limit your power consumption: LED fixtures. Ebay is full of LED replacement bulbs and lighting strips that offer good replacement options which will lower power consumption at a low price. Don't be afraid of Chinese LED offerings; many people have good success with them. It should be noted that no matter how low you go with your power consumption, you will NOT be able to run your air conditioning on the 12 volt system. An average 13.5K air conditioning unit uses around 12-15 amps while operating on 110v power. This corresponds to 110 to 140 amps equivalent while operating on 12v, plus conversion losses while changing the voltage. This rate of discharge would leave even the largest batteries dead in a matter of minutes. Not to mention, the need to run extremely large cables to handle the amperage load from the battery to the air conditioner. It is possible to extend the time you have with your battery, however. A more popular setup is to utilize two 6-volt "golf cart" batteries in series for 12 volts of power and a large reserve capacity. This offers the ability to deeply discharge the batteries, while keeping a long service life. You should expect to pay around $300-500 to convert a single 12-volt battery setup into a dual 6-volt battery setup. This includes about $120 per battery and the cables necessary to route the new system. You may spend a bit more on changing the mount for the system. Remember to keep your batteries protected from the elements/theft with a quality battery box. You can also increase your off-grid time by adding some solar panels. Solar technology has become cheap enough to allow an average person to afford outfitting these panels to an RV. A good solar setup can provide over 100w of power during peak sunlight. This will keep batteries charged, and allow usage of 12v accessories without discharging batteries. Thanks! You Aussies get the cool campers (caravans)... off-road capable? Ysplz. Also, a good point about the anode rod. Hot water heaters may or may not come with them; Mine does not have an anode rod and instead relies on the user to drain the water periodically to avoid corrosion and buildup. When it comes to maintaining your RV, you are best served with preventative maintenance wherever possible. Wheels and tires are a sticking point for many in the industry. The problem is with ST (trailer service) tires. Unlike automotive grade tires, trailer tires are patterned differently, graded differently, and constructed differently. This causes many issues for people who misuse their tires. First, an ST tire is either a bias-ply or a radial tire, much like a car tire. There are people who swear by both, but either will serve well if maintained properly. A radial will typically offer a smoother ride and lower operating temperature, while a bias-ply will usually offer a higher load rating, all else being equal. Trailer tire load ratings are given at maximum pressure, usually around 55 psi, and are rated for a maximum speed of 65 mph. The sidewall construction on a trailer tire is also typically much stiffer to resist trailer sway and to stand up to scrubbing while turning. Many people who have problems out of their trailer tires are towing at a speed greater than 65 mph, and/or operating with a lowered tire pressure. Tires should be closely monitored for signs of stress: cracks from aging, uneven or excessive tire wear, tread separation, road hazards, etc. In addition, tires should have an appropriate safety cushion as compared to the load they are carrying. For example, if your trailer has a 7000 lbs gross weight rating, your total tire capacity should be equal to or greater than that weight. 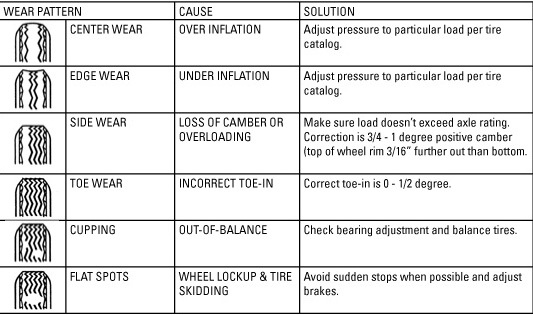 In this case, each of four tires should have an individual weight rating of 1750 lbs or greater. Keep in mind, some of the trailer's weight will be carried by the tow vehicle, leaving an adequate safety margin when total tire capacity equals the GVWR of the trailer. Another important feature of any good-sized camper is the braking system. 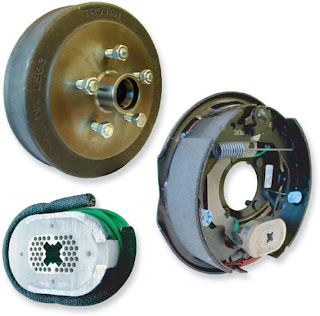 There are a multitude of braking systems available from electric over hydraulic with disc brakes to the tried-and-true electro-magnetic drum brakes. Electric drum brakes are by far the most common, and the system I will discuss here. The system is not unique to campers, and is an industry standard as far as parts and fitment is concerned. The system operates via an electromagnet. The oval metallic piece in the above photo is drawn to the back side of the brake drum when electric current is applied. As it is drawn towards the drum, it actuates a cam system attached to the brake shoes that cause the shoes to expand outward. As the voltage to the shoes increases, the shoes contact the drum increasingly tighter until wheel lockup occurs. For a full inspection of bearings and brake/shoe adjustment, this is an outstanding resource with photos. Keep in mind that an E-Z lube axle has a grease zerk on the end of the axle, which pushes grease into the bearings. This is great, but it's important that you do not over-lube the axle and blow out the grease seal. This will cause grease to contaminate the brake drum and shoes causing unpredictable brakes or no brakes at all. For activation purposes, it is necessary to get a good brake controller for your vehicle. There are two types of common 12-volt controllers: Time-delayed and proportional. Time-delayed setups are exactly what they sound like. They operate the trailer's brakes after a preset amount of time, and they supply a steady voltage set by the user. This is inefficient, as you are left with either too little braking or too much braking on the trailer. A proportional controller varies the voltage given to the trailer brakes according to how hard the vehicle is braking. By using an inertial pendulum, the brake controller senses g-forces in the vehicle and operates a variable-resistance circuit to change trailer brake output from zero to the full 12volts (lockup). I use a Tekonsha Voyager, as it is a proportional controller that won't break the bank. The unit I have on my Chevy Tahoe is actually the third I have owned. All have given reliable service; I have regrettably left each one I had before in a vehicle I have either sold or traded. A current crowd favorite has been the Tekonsha Prodigy P2. It costs about double what I paid for the Voyager, but offers even more precise control over the braking functions of the trailer by digitizing settings (rather than the analogue dials on the Voyager). A properly adjusted rig will stop as short or shorter (more braking axles) than the tow vehicle alone. I currently have the Prodigy P3, would never use anything else now. Its crazy how good this brake control is. Flea, my brother has a 30 foot trailer he tows with his 2500 HD. If you have any questions let me know, and I'll see if he has any information.